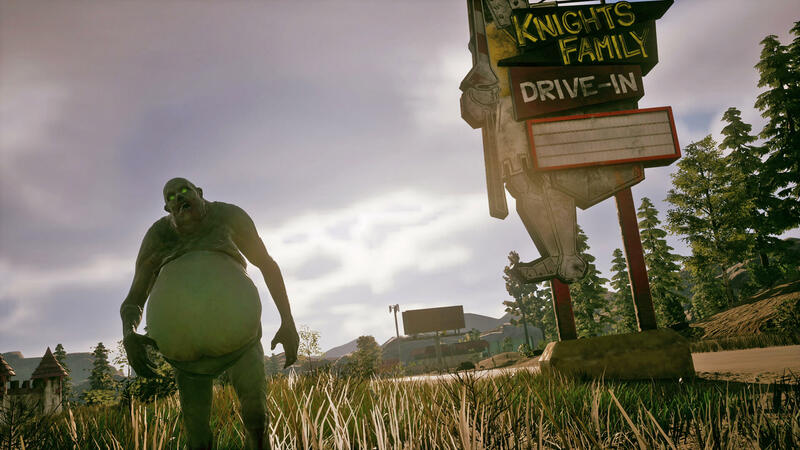 Undead Labs and Microsoft are set to shamble onto the scene next week with the highly antcipated sequel to 2013’s State of Decay. The original was a surprise hit, a combination of role-playing, action, and strategy that brought with it a unique take on the zombie-killing genre. It was a no-brainer that Microsoft would greenlight a sequel. But I never expected it would take five years. The story picks up some 18 months after the apocalypse. You won’t be playing doe-eyed victims trying to forge a new life this time, instead you’re in control of hardened survivors. The gist of the game is that you’ll be switching between different members of your community in an effort to continuously fortify your base, gather supplies, and beat back the zombie hordes. All the while you’ll have to contend with zombies and hostile humans while maintaining the morale of your community and trying not to get anyone killed. 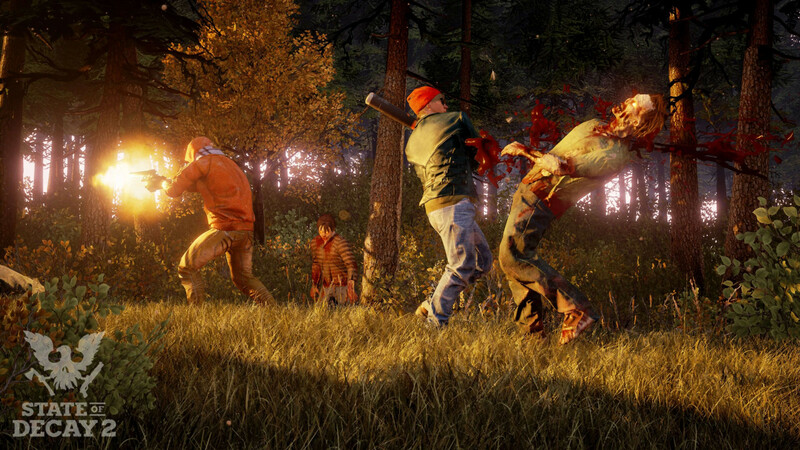 State of Decay 2 features perma-death, meaning when a character dies they’re gone forever. Each survivor is procedurally generated making them unique, and Undead Labs does a good job of making you care about them. The closest game I can compare it too – aside from the original State of Decay – is X-Com. 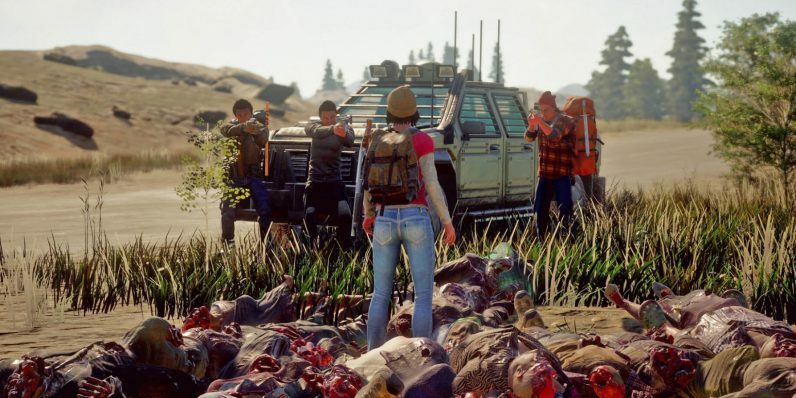 The world of State of Decay 2 is as full of zombies as Grand Theft Auto 5 is of people. It’s truly impressive how many bad guys the game manages to squeeze into its map, and that’s not to say the map is small by any means. You’ll spend a lot of time traversing the geography in this game, and there’s a lot of it. 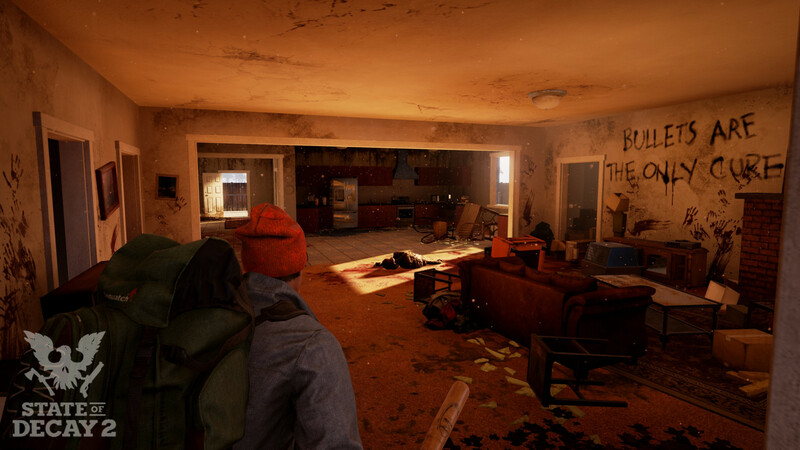 In other huge open-world games I find myself wishing the map was bigger, but in State of Decay 2 every meter further from your home base puts your characters in even more danger. The game masterfully cultivates a sense of futility that often feels like an episode of The Walking Dead, but it rewards you for careful planning too. 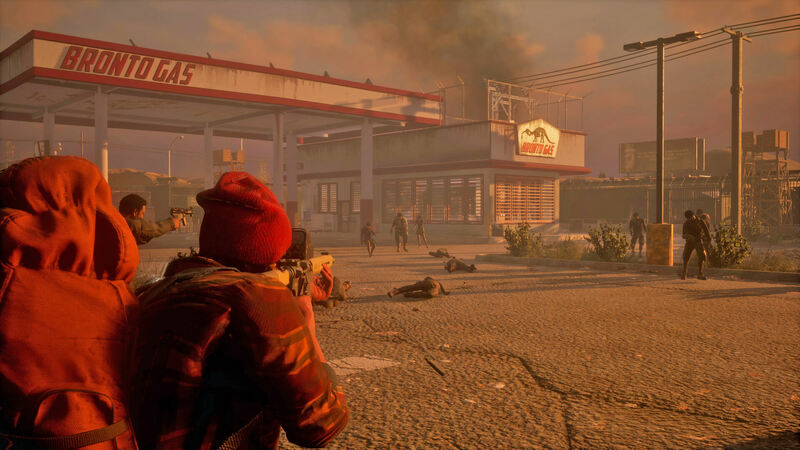 The first State of Decay game had the tendency to get boring pretty quickly. The tedium of performing what equated to perpetual fetch quests almost eclipsed its brilliance. The sequel improves on that by walking the fine line between survival and adventure. And by adding in co-op multiplayer. Co-op works wonderfully and, because this is a Play Anywhere title, it supports cross-platform multiplayer between Windows and Xbox One. Plus, thanks to Microsoft’s “home Xbox” feature, you can play your copy on PC while someone else in your house plays on your home Xbox under their own profile – that way you both get achievements and you don’t have to buy the game twice. It supports up to 4 players, but only the ‘host’ can accept quests and gain standing in their community. The other player are visitors in the host’s world there to help out. It’s better than it sounds, really. As a guest you still play as a member of your own community, and can swap among your characters. When adventuring outside of base, player characters can only search containers for loot that are marked (color coded) for them. When you store items in multiplayer you access your own community inventory just as you would in an outpost. The exception is goods that come in rucksacks such as building materials, food stocks, ammo stocks, and medicine stocks – those get donated to the host when you drop them off. I actually liked being a guest because it gave me the opportunity to stockpile items and level up characters without worrying about blowing my own quests. The story is the same whether you have human-controlled guests in your community or not. In fact, the biggest problem I have with the gameplay is that the multiplayer and single player both share the same horrible flaw: the game can’t be paused. I understand that pausing isn’t a thing in multiplayer games, but there’s almost nowhere in the game’s world where your character is truly safe and that means setting the controller down to go pee (or tend to a crying baby, as is the case with me) means risking your characters’ lives. I probably wouldn’t be infuriated by the lack of a pause feature if the game’s autosave feature didn’t sometimes lose 20 or 30 minutes worth of work when I exited it. Undead Labs spent the five years between titles crafting a new engine with support for updated game systems, new animations, and smarter zombies. The results are that the sequel looks better, plays better, and has more strategic depth. An unfortunate side effect is that it’s buggy as hell. I’d like to point out that the game is still technically in pre-release and it’s incredibly likely to receive patches up to and beyond its official launch. I’m hopeful most, if not all, of the problems I had will be fixed. But they were almost game-breaking for me. My first hour with the game was a mess. I got to experience the introduction twice thanks to a game-freeze, and the first zombies I encountered outside of the opening scenes were floating in mid-air high above my character’s head. At one point my co-op partner couldn’t stop sneaking, at another her menus stopped functioning. Both of those issues required restarts. And my woes persisted beyond just the beginning. The game is full of clipping – whenever my character sneaks my partner sees them clip through the ground, just a torso floating along. And the multiplayer freezes regularly. The single player does too. Moving on, the graphics are an improvement on the original, and while they aren’t necessarily going to drop your jaw, the game’s world and inhabitants feel busy and alive. The animations are leagues better than the simple ones from the first game – though finishing off downed zombies still causes the player to be sucked into the animation if they initiate it from too far away, which can be an advantage. But it looks weird. The best parts of the game have nothing to do with the graphics, audio, or voice-acting (it’s great, by the way). My favorite thing about State of Decay 2 is that it’s a game that doesn’t mind telling me a story, but it knows how to get out of my way too. I fell in love with my community, and even more so when my human co-op partner brought her characters to help. One of my survivors had the trait “kind of an idiot.” It caused her to learn skills in the wits category at a penalized rate. At first this bothered me, but after surviving a few near-death experiences with her I began to develop a fondness for her beyond my other more skilled people. She may have been dumb, but she had a lot of heart. That’s the State of Decay 2 experience in a nutshell. The bugs make it feel pretty dumb, but it’s full of emotion and heart and it’s quickly becoming my favorite game of 2018. If you can get past the bugs it’s phenomenal. Anyone who’s ever sat around with their friends having a serious discussion about what they’d do if the zombie apocalypse happened in their town needs to play this game – preferably with those same friends. 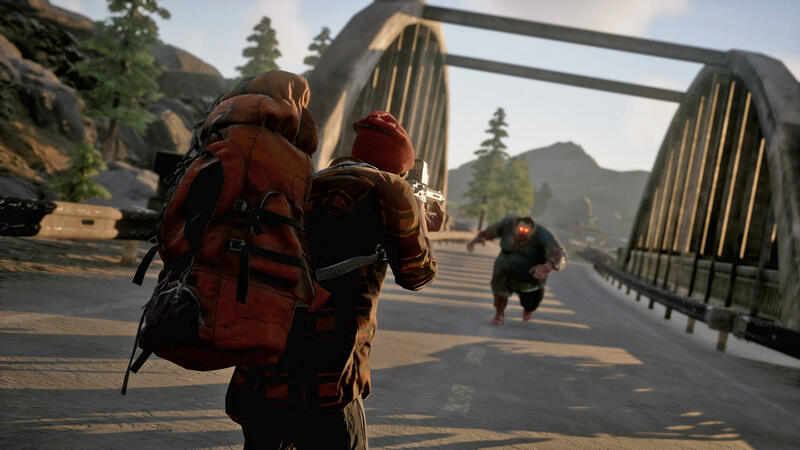 State of Decay 2 launches on Xbox One and Windows 10 on May 22. It’s available in a standard edition for $29.99, a deluxe edition (featuring early access on May 18) for $49.99, and as part of the Xbox Game Pass subscription, which costs $9.99 per month.